It's time for the New Product Launch! All the Stamps, Die-namics, and Stencils can be found HERE. Please remember to visit each of the MFT Designers' June New Product Launch posts on the MFT Blog and leave a comment by the end of the day on Thursday, June 5 for your chance to WIN one of two, $100 Gift Vouchers. Ready? Set. Comment! I hope you have enjoyed the countdown this week, there are so many fun products this month. One of my favourites is the new Toucan Do It stamp set. I just love the birds in this set. Who can resist a bird in leg warmers and a headband? 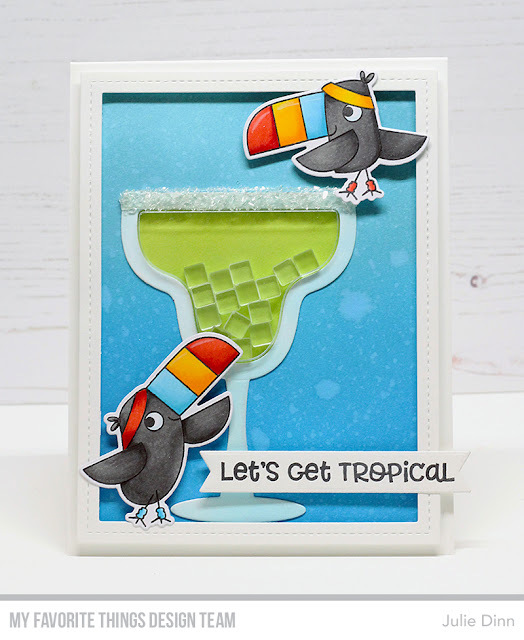 Since every great workourt should end with a cocktail, I paired the toucans with the Margarita Shaker Window & Frame Die-namics. How cute. You can't more tropical than a margarita, can you? Love the pairing...toucans and a margarita glass (with even salt around the rim)! Too clever! The toucans add such a fun vibe to your card! What a fun card! Love the "ice cubes"! That’s adorable ... and very clever! Now those are a coupla toucans I'd like to know! Great release and great inspiration. A perfect card for a party! So fun - loved how you combined the margarita glass and the toucans! Such a fun card! Love the adorable images, wonderfully vibrant colors and the ice cube shaker bits are just fantastic. The tucans with the margaritas is something that I would never have thought to combine and I love your card!!! ❤ Thanks for sharing a very unique combination! Oh love this! Really clever to use the martini glass! Yummy card! Now I have to get those toucans! This is so cute! Those birds sharing a drink just crack me up! Ha ha ha! What a great card! Love this idea! Great card, i love the combo of two stamp sets. LOL! I don't believe those fashionable toucans went to the gym at all. They are just hanging out to be seen! Love the idea of using Diamond Dust for the salted rim of the margarita! Yum! Love all the fine details on your card! What a fun card. Those toucans remind me of Toucan Sam! Awww!!! It's so funny! Your card and colors are simply amazing!!! That's so cute! It makes me want a margarita in a tropical bar somewhere warm and sunny. Adorable card! I love the drink. Great coloring. Ha! What a fun and cute card! The margarita topper looks real! Now that's funny!! Love combining the critters with the martini shaker!! Ack! Such a great card! Love the salt on the rim and the ice cubes in the glass! The colors are fabulous. Great card. It’s great the toucans are hanging out at the cocktail lounge. Such a great idea. Thanks for all your hard work as a design team member! Amazing card. So clever to put in the 'ice cubes'! Perfectly wonderful!!! The Diamond Dust is like the icing on the cake!!! Thanks so much for sharing! Love the salty rim of that margarita. Looks so refreshing . Is it happy hour yet? So fun--I like the vibrant colors. Fun, clever card! I love it! These two birds are just so fun !! Such a funny set of martini friends. So colorful. Such an bright and happy card. Love the sparkle and dimension on top of the glass. What did you use? Whatever it is, its perfect! To me one of them is just about to bathe in the drink! Lucky Toucan.... Fun card! Great blend of products on this card. Thanks for sharing your creativity. This made me smile immediately! So fun, great card!!! Such a fun and creative card! I can't contain my giddiness at how cute this card is - combo of toucans with the drink shaker - adorbs! Love this with the shaker glass, awesome! Super adorable! This is my favorite stamp set too!!! Thanks for the countdown inspiration too!